The City of Vancouver, British Columbia has adopted an ambitious target to move to 100% renewable energy (RE) by the year 2050. In order to realize the goal of becoming a fully renewable energy-powered community, buildings and transportation systems in the city will need to become highly energy efficient. The intention behind this urban energy transition is to increase quality of life, improve equity, and bolster the economy while reducing greenhouse gas emissions. With this commitment in place, the City of Vancouver developed the Renewable City Strategy, which outlines the steps to achieve 100% RE, providing the groundwork for other cities to follow. Renewable Cities has played an instrumental role in initiating Vancouver’s energy transition. Now, with the 100% RE goal in place, we will continue to support Vancouver and other local governments in implementing this energy agenda. Dozens of local governments in North America have now committed to 100% renewable energy in some form, a number that is increasing every year. Vancouver has long been a climate and energy leader, and has a strong foundation in sustainable community planning. In early 2014, Renewable Cities’ founding team began developing a new program focused on the municipal transition to 100% renewable energy. Over the course of a year, the team conducted research and scoping interviews and began building partnerships in advance of the program’s launch event, Global Learning Forum 2015. Building on this momentum, Vancouver City Council unanimously adopted a comprehensive 100% renewable energy target in March 2015, making it the first jurisdiction in North America to commit to such a target. During the council session where the goal was adopted, members of our team spoke in favour of the resolution. The Renewable Cities program officially launched at our Global Learning Forum in May 2015, which convened the leaders of the urban energy transition movement and the concept of 100% renewable energy on the map. 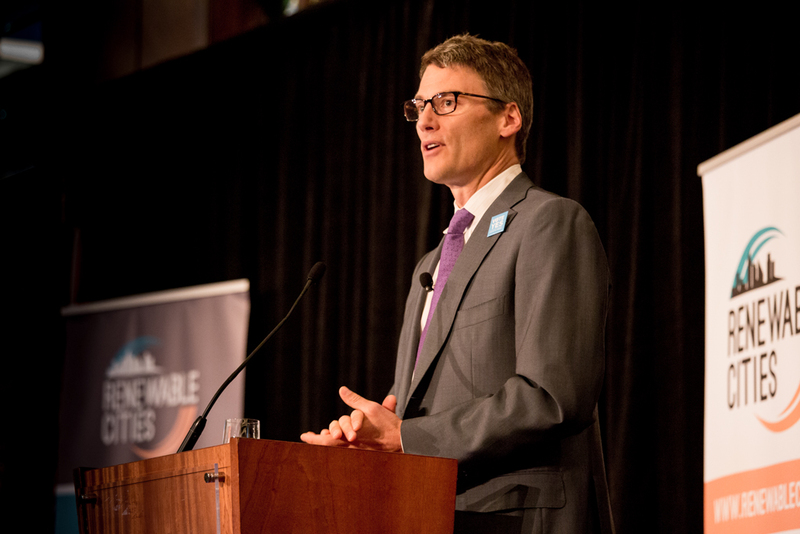 During the forum, Vancouver’s Mayor Gregor Robertson and City Manager Sadhu Johnston participated in an interactive plenary session where conference participants provided feedback on how to best achieve 100% RE. Our team also facilitated a workshop where international experts provided advice to senior City of Vancouver officials towards achieving 100% renewable energy. In June and July of 2015, Renewable Cities partnered with the City of Vancouver to help guide the development of the Renewable City Strategy, a first in North America. We provided three independently facilitated dialogues with staff and key stakeholders on the topics of waste, the built environment, and transportation. The workshops provided an open space to explore challenges, opportunities, and quick starts for the City of Vancouver in reaching 100% renewable energy. These workshops—in addition to advice and feedback solicited from international experts during Global Learning Forum 2015—helped to shape Vancouver’s Renewable City Strategy, which was formally adopted in November 2015 during a council session. At this session, Renewable Cities spoke in favour of the groundbreaking plan and subsequently placed a series of op-eds in local media outlets in support. Since 2015, the City of Vancouver has been working to achieve 100% renewable energy through conservation and supply measures. Notably, Vancouver adopted its Renewable City Action Plan in 2017, setting year 2030 interim targets of 55% renewable energy (currently at 30%) and a 50% GHG reduction target, relative to year 2007 levels. For the built environment, Vancouver adopted the Zero Emissions Building Plan, is working to expand the neighbourhood energy utility, and unveiled the new Zero Emissions Building Centre of Excellence, in partnership. On transportation, Vancouver developed a new electric vehicle strategy, requiring that all new buildings be 100 per cent EV-ready. Further, after achieving half of all trips made by sustainable modes in 2015, Vancouver is continuing to undertake complete streets redesign and invest in cycling and transit infrastructure. We will continue to work with the City of Vancouver and other stakeholders in the implementation of 100% renewable energy, both locally and beyond.